Chandigarh, April 17 (IANS) Punjab Chief Minister Amarinder Singh here on Wednesday ordered a special girdawari (harvest inspection) for assessment of crop damage caused by untimely rain and storm in the past 72 hours. "In his directive to the departments and officials concerned, the Chief Minister asked them to start without delay, the special girdawari for damage assessment due to the weather disruptions," a state government spokesperson said, adding the assessment has to be completed on priority. Wheat crop is being harvested in Punjab for the past 10 days. The order came after the Opposition Aam Aadmi Party (AAP) and the Shiromani Akali Dal (SAD) expressed concern over the losses. AAP legislator and Leader of Opposition Harpal Singh Cheema said while the damage was widespread, it was serious in Ropar, Jalandhar, Patiala, Fazilka, Kapurthala and Bhatinda areas and sought release of 100 per cent compensation for the affected farmers within a stipulated time. "In many areas, crops have been totally destroyed resulting in losses of lakhs. 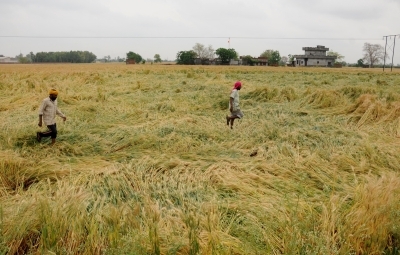 In 500 villages of the Ropar district, ready wheat crop in over 2,000 acres was damaged by the rain. A large number of distressed farmers from these villages held a dharna to press the government for release of compensation," Cheema said. Former Punjab Chief Minister and Shiromani Akali Dal leader Parkash Singh Badal too demanded compensation of Rs 15,000 per acre for the affected farmers.